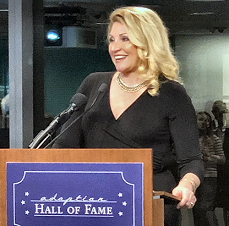 Premiere Networks syndicated air personality Delilah -- the most-listened-to woman on radio -- was inducted into the 2018 Adoption Hall of Fame at a ceremony held in Washington, DC, Thursday night. The Adoption Hall of Fame Award is given by the National Council for Adoption (NCFA) in recognition of outstanding commitment, service and sacrifice for the cause of adoption by an individual or organization who has positively impacted the practice of adoption. A mother of 13 children, 10 of whom were adopted, Delilah was honored for her decades-long commitment to children in need of a family, and for using her national radio platform and her non-profit organization Point Hope to celebrate adoption and raise awareness of children waiting to be adopted from the U.S. foster care system. "As a beloved radio host with a massive following, Delilah has been an inspiration to millions of people, serving as a friendly voice for callers to chat with throughout life's ups and downs," says NCFA president and CEO Chuck Johnson. "With a loving heart, Delilah has made a home for the 10 children she has adopted. She is an incredible advocate for children to have loving, permanent families. Through her work at Point Hope-a non-profit organization she founded over a decade ago-Delilah is committed to advocating for children in foster care and providing resources that reduce the burden on foster parents and let kids in care know they are not forgotten."